To plumb a basement bathroom, start by locating the main drain run. To do that, in the basement you’ll see a 3- or 4-inch main “stack” coming down one of the walls. That is one end of the main drain run. There should be a sewer clean-out fitting by the wall facing the street or it might face a driveway. The main drain will probably run straight from the stack to the clean-out. Mark the floor to show the drain run. Next step to plumb a basement bathroom is to mark the floor with where you want the shower, toilet and sink drains to go. With a sledgehammer, break the concrete along the main drain. Dig an exploratory hole or two near where you anticipate tying in the new plumbing to the main drain. Don’t be concerned if you have to dig several smaller holes until you find the drain pipe. You’ll need a hole roughly 2 to 3 feet across when you begin to work. With the drain located, you can verify that the planned bathroom will work as designed. Make any changes necessary to the layout and clearly mark the basement floor with the locations of the new drains. 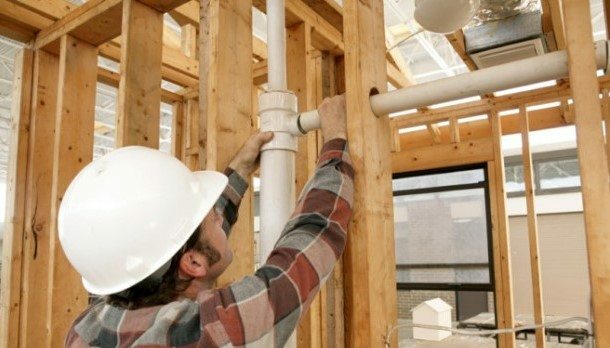 It is critical to the success of the bathroom, and to getting building inspector approval, that the pipe runs have a slope of ¼ inch per foot (Check your local codes, as some areas only require ⅛ inch per foot.). Make sure the longest run of new drain has sufficient height above the main for the run. The simplest way to do that is to measure the depth in inches from the basement floor at the start of the run and where it couples to the existing drain, subtract one from the other and multiply by four. If you have a 3-inch difference, for example, the maximum run you can have is 12 feet. Next break out the concrete for the new basement bathroom drains. Remember, the shower will need added depth to accommodate a trap. Both toilet and sink have their own traps. As you are doing this, determine how you will run the vent pipes. Every drain has a vent pipe and code will tell you how big this will need to be. 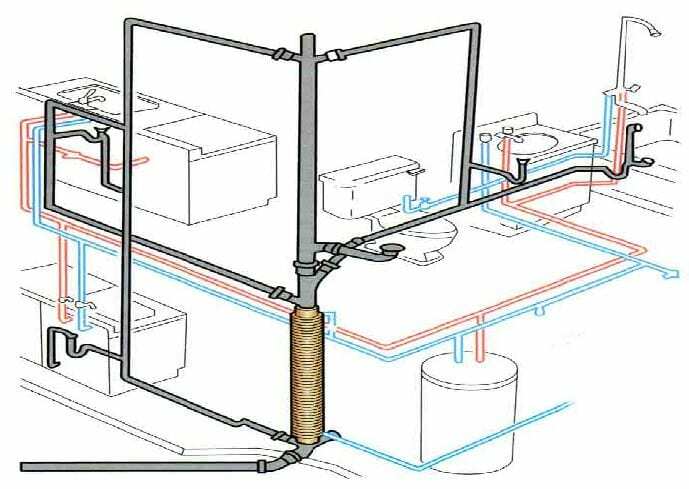 But since any pipe under a slab has to be at least 2 inches, it’s best to make all the pipe 2 inches, except the toilet drain, which must be 3 inches or larger. When the digging is done, assemble the pipe but don’t glue anything until you know it’s going to work. 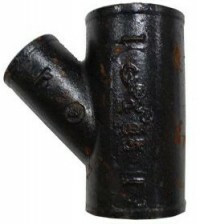 The no-hub Y-fitting can be cast iron or PVC. Now break into the cast iron drain to assemble the Y-fitting. For this, the simplest tool is a pipe snapper that will hopefully give you a clean crack. Rent one if you don’t own one. If you’re working with old cast iron, it may just crush so you’ll have to use a hacksaw. 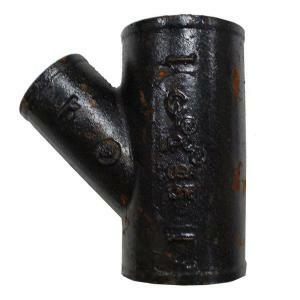 Cut out the appropriate length to accommodate the no-hub Y-fitting, which can be cast iron or PVC. Start assembling the drain system making sure the downward slope is correct and the vertical location of the drains is right. You may have a little leeway with positioning the toilet and sink, but the location of the shower drain is critical. When the drain system is complete and capped, have the new drain system inspected and approved by the building inspector before you back fill the drain trench. Fill in the holes to 3 inches below the basement floor. Pour 3 inches of concrete to replace and level the floor. Now you’re ready to frame the bathroom. Once framing is in place, run the vent pipes from each drain. You can join them together before tying in to an existing vent pipe. Don’t concrete the area surrounding the shower drain. Leave it open at this point in case you need to reposition the drain when the shower pan is framed in. Once you know the drain is positioned correctly, finish the concrete.